Who: Play House. We’re a small interior design firm based out of Austin, TX, with offices in San Diego and Brooklyn as well. What: The Good Design Great People Project – Full scale interior design services, including a complete and comprehensive design plan that we will execute for you over a 6 month period of time. When: Now - Oh Em Gee... It's so on. Where: Your place. Let’s have a look at what you’re workin with. We bet we can make it awesome-er, ish... we can make it super awesome okay?! Why: Because great people deserve good design. How: Give us a call. We’ll explain everything. How much: $3,750.00 - this breaks down to an embarrassingly low hourly rate of $15.63. But go ahead and take advantage of us. We want you to. 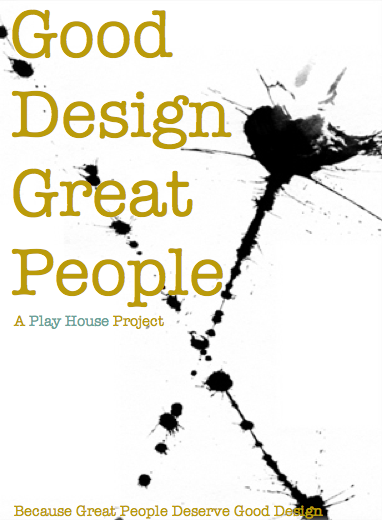 To learn more about our Good Design Great People project and why we’re doing it, click the link below.